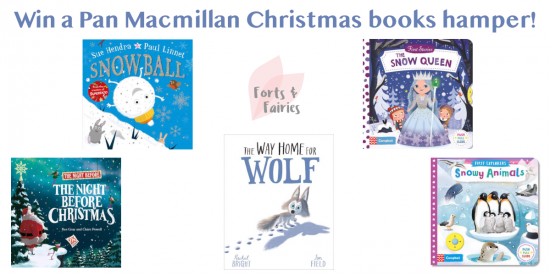 Win a Pan Macmillan Christmas books hamper! Congratulations to Cirsten Van Den Heuvel for winning this awesome hamper! We love reading Christmas books with our children during December. It really is the most magical time of the year, and reading wonderful Christmas themed books just adds to that sparkle. Check out my guide on the top new Christmas themed books from Pan Macmillan to find your favourite. In the spirit of Christmas, and to help spread some holiday cheer, I’ve teamed up with Pan Macmillan South Africa to give away a Christmas books hamper to one very lucky reader! You can win this awesome hamper which includes five fantastic new Christmas themed books. Get your entry in today by answering the question and filling in the form below. To be eligible to win you must have liked the Forts and Fairies Facebook page. You can also follow Forts and Fairies on Instagram, but it is not a requirement to enter. Only entries from South Africa will be eligible to win. One entry per person please. Competition closes on 13 December 2018. Terms and conditions apply. Thanks to Pan Macmillan South Africa for sponsoring this awesome hamper! Christmas Sorted! Win an awesome hamper from Penguin Random House! The Way Home for Wolf looks too cute! My son still loves his Christmas stories leading up to Christmas Eve!! I love The Way Home for Wolf, especially after your review… think this would be a wonderful book to read to my son at his age, to teach him that it’s okay to get a little help from friends and family if you are struggling. <3 Sounds like a beautiful story. The book: THE NIGHT BEFORE CHRISTMAS, looks like a book to read with some marshmallows and hot chocolate around a bon fire.